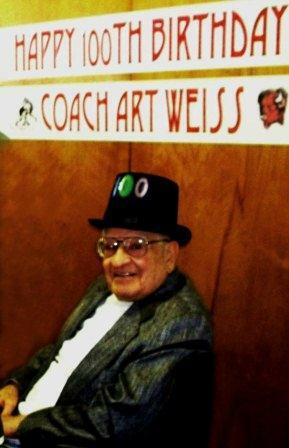 Editor’s Note: Clearfield wrestling’s legendary founding father Arthur J. Weiss Sr., perhaps best known as the dean of Pennsylvania schoolboy wrestling, passed away the morning of Friday, May 13, 2011 at the Clearfield Hospital. 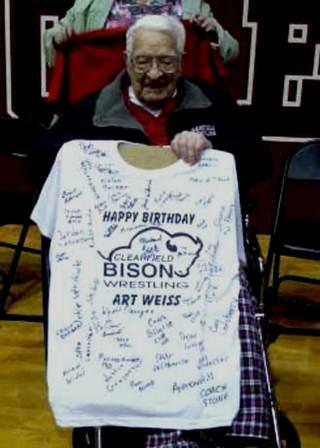 Weiss’ last wrestling appearance came Jan. 28, 2011 in Clearfield High School’s gymnasium, which bears his name. He arrived at center mat and flipped the disc, receiving a standing ovation before Clearfield wrestled Lewistown. Weiss was 102 years old. A memorial service for Weiss has been set for 4 p.m. Saturday, May 21, 2011 at the Clearfield Presbyterian Church. Interment will be in Hecktown Hope Cemetery, Nazareth. A reception and receiving of friends will follow his service in Westminister Hall. The following is a profile piece written about Weiss by this writer and previously published in Clearfield wrestling’s alumni newsletter following the program’s 75-year anniversary celebration in 2009. This writer updated the initial piece for its current publication. 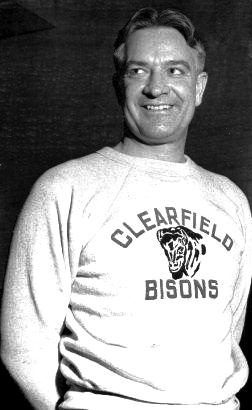 CLEARFIELD – Arthur J. Weiss Sr. laid the foundation for Clearfield wrestling’s excellence in 1934-35. His teams’ swift ascent on Pennsylvania schoolboy wrestling dominance also inspired its growth into the current 77-year legacy. Weiss’ success has built the state into a wrestling warehouse and also set the foundation for Pennsylvania as a national power, where it arguably holds top position today. His teams rose to dominance by 1937 and remained so through most of the 1950s. Only eight Pennsylvania natives had earned NCAA Division-I Wrestling All-American medals at the beginning of the Weiss-tenure at Clearfield. However, the state’s All-American count multiplied by 10 for a total of 82 during his 25 years as head coach. From 1928 through 1960, Pennsylvania registered 98 All-Americans and was third nationally behind Oklahoma (260) and Iowa (113). Of those, Clearfield registered seven individuals for its combined 12 All-Americans for the ninth spot nationally for high schools with the most and was the only representative from Pennsylvania. During his Clearfield coaching tenure, Weiss conducted high school wrestling clinics, fostering the sport’s growth across the Keystone state. Pennsylvania subsequently had five high schools climb into the Top 16 for the most All-Americans nationally from 1961 through 2011. In fact, a quartet of Pennsylvania high schools claimed spots in the Top 10 during the previously said timeframe. State College held the fifth position with nine wrestlers and 14 All-American medals. Easton, Trinity and Lock Haven rounded out the bottom three with eight wrestlers apiece. Easton collected 17 medals while Trinity and Lock Haven had 13 and 12 medals, respectively. Pennsylvania has since surpassed both Oklahoma and Iowa, taking over the top spot via 504 All-Americans from 1961 through 2011. Pennsylvania currently has the most with 602, including 512 since the end of Weiss’ tenure at Clearfield. Oklahoma currently holds second and Iowa third with 531 and 463 total All-Americans, respectively. Ohio (326) and Illinois (312) rounded out the top five states. Clearfield head coach Jeff Aveni believes Pennsylvania’s wrestling roots lie in the basement shower room at his alma mater, where the legendary coach held his early practices 77 years ago. “It’s what you want to be as a coach and a wrestler. You want to live up to the standards that he’s set forth. Clearfield wrestling, as a whole, all started with Art Weiss,” he said. Aveni grew up in the program and learned from those surrounding him while a competitor and later as an assistant coach. He said those morals, values and overall work ethic had long ago been instilled in the Clearfield wrestling program. When he thinks about the Clearfield mat program, tradition comes to mind first. Weiss’ philosophy has been passed from generation to generation and also influenced the mold for his present program, according to the 11-year head coach. Born near Nazareth Jan. 12, 1909, Weiss became keenly interested in sports as his brothers were all athletes. He captained the first football team as well as both the basketball and baseball teams before his high school graduation in 1927. Following high school, he studied at Perkiomen Prep in Pennsburg and was a member of the basketball team. He once arrived to practice early hoping to work on foul shooting. Instead he discovered the doors were locked to the gymnasium. “I heard some noise over in the corner of the building and found some guys wrestling around. I had this real wise guy pull on my leg. He was a pretty big fella – a heavyweight. I didn’t know any wrestling moves, but I pinned the guy,” he said with a chuckle. Unbeknownst to Weiss at the time, the school’s head coach had come into the practice room, and said “how about coming out for wrestling?” Weiss told the coach he didn’t believe in quitting another sport. Weiss later wandered back to wrestling practice and was out for the team for a few weeks. He said despite his growing interest in the sport, there was little time to pursue it, as he continued his education at Albright College in Reading. In 1932, Weiss earned a Bachelor of Science in Education and accepted his first teaching position at the Clearfield Area High School. He taught both science and mathematics during his 42-year tenure. And, almost by happenstance, he headed the wrestling program for 25 of those years. Weiss said at the time, the school only had football and basketball but was interested in wrestling intramurals. Mr. Fred Sweeley, then the high school athletic director, approached him to head the wrestling team with four duals meets already scheduled. Without any team members in place, he approached students, asked their weights and persuaded some to attend wrestling practices. 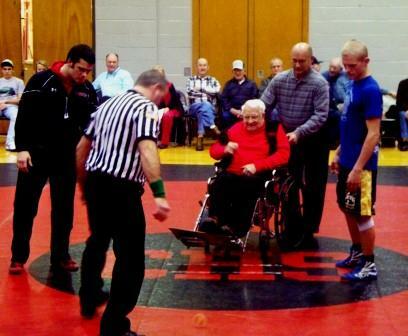 He began the Clearfield wrestling program in December 1934. “I had to get a team together. It just so happened I needed an 85-pounder. I saw this little fella who looked like he’d be an 85-pounder, and I stopped him (Joe Quethera) in the hallway,” he said. Clearfield finished its first season with a 0-3-1 record and improved to 3-4 the following year. Weiss’ teams didn’t hint to the legacy that would soon follow. With the program still in its infancy, Weiss’ teams rose to dominance by 1937, starting an eight-year win streak with 64 consecutive dual meet victories. DuBois scored a 25-12 win to end the streak in 1945. Following the loss, Clearfield went undefeated for another 51 wins, before Philipsburg upended the Bison, 24-15, in 1951. The Weiss-coached teams put together 20 consecutive dual meet wins from 1952 through 1953. During his teams’ dominance from 1937 through 1953, Weiss recorded 138 wins, 5 losses and two ties. 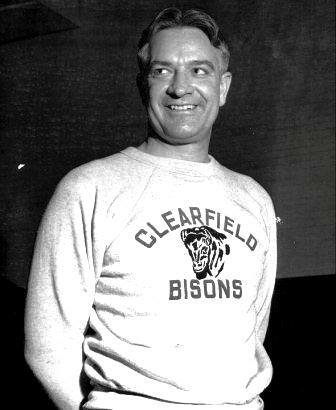 As head coach, he led the Bison to 14 undefeated seasons and a 184-37-3 overall record. Weiss’ teams not only saw dual meet success, but also dominated the then combined District 6-9 Wrestling Tournament, winning 11 straight titles until Bellefonte ended the sweep in 1950. The Bison also collected three more crowns, before the districts were split into two tournaments. In 1954, District 9 would hold its own tournament with Clearfield coming out on top. Weiss continued on to win the district team title each year until his retirement in 1959. In all, he earned 20 district titles in 22 tries. Weiss produced 99 District Champions, 16 Regional Champions (this tournament wasn’t held until 1951) and had 24 wrestlers combine for 31 state titles. He established the current state mark for the coach with the most state champions and has held the same for more than 50 years. Retired North Alleghany head coach Gus DeAgustino holds the second spot with 21 state champions and Steve Powell, who currently coaches at Easton, is in third with 20 state champions. Clearfield has inherited a state championship legacy from its founder. With 40 individual titles, the Weiss-founded program holds the current Pennsylvania high school record for the most state champions. Easton currently sits in second with 35 state champions. In the early years, Weiss attended former Lehigh University head coach Billy Sheridan’s wrestling camp at Saylor Lake in the Pocono Mountains. At the time, a Lehigh wrestler was training for the Olympic Games. “I didn’t know a whole lot and was at his weight. He needed someone to practice with, and I was his guinea pig,” said Weiss, whom traveled with a carload of wrestlers to the camp again a few years later. Weiss also attended national tournaments and sought learning opportunities from coaches in the collegiate ranks. He frequently inquired about various wrestling holds so that he could instruct his own pupils. “They’d say, ‘You want us to give up our secrets,’” he recalled with a chuckle. Once his team reached dominance, Clearfield became widely known across the country. Collegiate coaches would later approach him for instruction at the national tournament. He once had an Oklahoma coach tell him their coaching strategies were similar. “He said, ‘You must coach a lot like me.’ I thought that was a real compliment,” Weiss said. Frank Shirey, 1941 State Champion, believes Weiss was and is the best high school wrestling coach in the United States. Shirey was introduced to the sport in 1937 when he was only an eighth-grader. He’d heard about practices in the Clearfield High School shower room with a mat so large that it rolled up against the walls. Shirey said although he couldn’t compete, Weiss allowed him and others to practice and invited them to tryout the following year. He was drawn to the sport, as it offered both individual and team efforts. 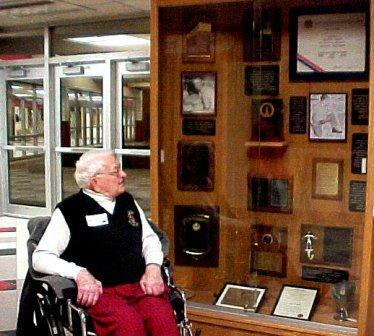 Shirey was a team member from 1938 through 1941 and won a state title as a senior. He recalled a rare personal match-up with Weiss. He said few, if any other Clearfield wrestlers, had the same privilege. “Coach always said, ‘Don’t feel good about beating the guys who everyone has beaten. But feel good about beating the guys who no one has beaten.’ I thought it was a good pep talk,” Shirey said. Jim Mohney, a two-time state champion, said his greatest accomplishment was making the team in 1940. In the early years, they wrestled on a flannel mat. If wrestling on newer mats, the tannic acid created fuzz, and it’d get into their noses during eliminations, he said. Mohney only managed wins in two matches during his first year on the team but learned a lot from those experiences. He said Weiss’ practice structure focused on drilling, and they had a takedown drill from opposite corners. “I always ended up going against the future champs. You had to score the takedown within 10 seconds because coach blew the whistle,” he said. He noted that it paid off during the state wrestling competition. Sam Harry, who was Clearfield’s and Pennsylvania’s first state champion in 1938, recalled Weiss’ infamous 3X5 index cards. He said Weiss would call off drills for the neutral, top and bottom positions, and his coach always ended with “now, do your favorite” move. Weiss also didn’t accept losing to the same opponent twice, and they were never allowed to work out with “patsies,” according to 1945 State Champion Jim Maurey, who said at Clearfield, it seemed as though they had a champion at every weight class. “There was always someone hammering on you. You had to work your way through the ranks, and you occasionally got knocked off,” he said. And, their mat improvements were made quietly. During their bout’s rest period, Weiss greeted wrestlers with a 3×5 index card. He indicated where they were in the match, where they should be and what was coming up, Maurey said. Once his wrestlers had stepped onto the mat, Weiss left decisions to them. For example, while recalling a regional match-up from his senior year, Russ Triponey, a 1956 State Champion, trailed 4-2 to a “Bedford boy” during the break between the second and third periods. When he reached the sideline, Weiss advised him of the bout’s score and that he would be on top for the final period. His coach then asked what he was going to do. “I said, ‘coach, I guess I gotta put him on his back,’” Triponey said. When he came to the sideline winning during the rest period, Weiss told him the team could only lose by 65 points. “It always made me think why when we had all those good guys on the bench. But it was important,” Johnston said. Weiss said many believed there was ice in his veins, as he didn’t speak much while his wrestlers were on the mat. However, he discovered his coaching strategies were successful, as his wrestlers responded well and gained respect from him in the practice room. While Weiss was known for historically successful teams, his preference was to be remembered for instilling sportsmanship in his wrestlers. “Coach said, ‘You shake hands after a match, not before,” Mohney said. “I taught them to wrestle hard and fair. I emphasized to go out there like a tiger but just tough, not dirty,” Weiss said. “And, I told them when it’s over, be a gentleman. Weiss recalled an individual bout from his team’s 1943 dual meet with Philipsburg. The Mounties had what he described as a very good team with a shot of winning. Harry “Sunny” Jordan had picked up a few tactics from teammate Francis “Mutt” Forcey. Forcey often started in the corner and “whammed” his opponent but always stopped on the mat. “Jordan decided he wanted to do that stuff. He didn’t stop though and drove the guy into the crowd. He did it twice,” Weiss said of his wrestler’s Philipsburg bout. He warned his wrestler if this style of competition continued, he wouldn’t only hurt the sport, but also his opponent. He advised that he’d forfeit the bout if this behavior continued. Two years later, Weiss’ team had an expected close dual meet with DuBois. Both teams were favored in four weights; the remaining three were toss-ups. The match would go to the team winning two of the three, according to a February 1945 edition of The Progress. During the dual meet, the Clearfield faithful were heckling their “guests” and or the official. Weiss stepped up to the microphone, warning the fans if it didn’t end, he would forfeit the match. DuBois pulled out wins in two of the three proclaimed toss-ups, in addition to an upset at heavyweight. The Beavers not only scored a 25-12 win, but also snapped Clearfield’s 64-dual meet win streak. Flegal said that Weiss instructed his teams to be modest in victory and gracious in defeat. He then recalled the team’s 21-20 defeat of Bellefonte in Penn State’s Rec Hall in 1949. Before the dual meet, Weiss attended church with his team, and according to Flegal, they prayed “not to win but to give it their best.” The match had been moved to Rec Hall, as neither school could hold the expected crowd. He said that more than 5,000 fans were in attendance for the dual meet during which he pinned Bellefonte State Champion Joe Masulla and then remained undefeated on the season. Weiss, however, deferred credit to his wrestlers and their practice ethic. He said he had families of wrestlers who were “his horses” and who were dedicated to the program. According to him, his teams strived for improvement in all phases of wrestling. He believed that he wouldn’t have experienced the success without his “horses” putting in the extra hard work. “They were willing enough to keep going when they were tired. And, they worked hard enough to become champions,” he said. 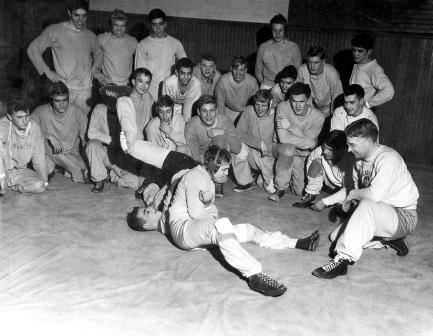 Throughout his tenure, Weiss visited high schools with his teams and conducted wrestling demonstrations. They even traveled as far as the Pittsburgh area. “We went to any school that asked us,” he said. Triponey said that in the 1950s, the smaller District 9 schools still did not have wrestling programs. The sport was believed to be much like professional wrestling. He said Weiss organized a group of wrestlers and toured two or three schools at a time. They set up an assembly at schools, such as St. Marys and Ridgway. “We (went through) like a five-minute practice and contests. We showed them what high school wrestling was all about,” he said. Triponey said these schools developed programs afterward. “You do something for a purpose and often learn from the same. It’s funny how when you give, you get. I would hear about something. It sounded good, and we’d try it,” he explained. Weiss not only had a hand in the development of wrestling across the state, but also the Pennsylvania State Wrestling Championships. On Nov. 21, 1935, Weiss helped establish the Western Pennsylvania Interscholastic Wrestling Association Tournament. He said the southwestern part of the state was pretty well organized with the Western Pennsylvania Interscholastic Athletic League (WPIAL). 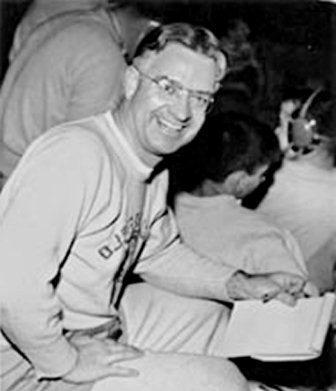 He met with Hubert Jack and Lou Shaffer and organized the WPIWA Tournament, and they held the first tournament on April 4, 1936 at Blairsville. His team finished 11th the first year and second a year later when it was hosted at Clearfield. Weiss said that coincidently the gentleman who was president of the WPIAL also served on a board for the Pennsylvania Interscholastic Athletic Association (PIAA). “He saw a good thing coming (with the WPIWA tournament), and I don’t blame him,” he said. The WPIWA Tournament then evolved into the state tournament. He said in 1938, the PIAA sponsored the first state wrestling championships with 78 competitors from 27 schools, contending for 10 individual titles at Penn State’s Rec Hall. Weiss was honored during the finals ceremony at the 2002 PIAA Wrestling Championships in Hershey. Former Clearfield head coach Michael Gill sat among the crowd. He said as the legendary coach was brought to center mat, each of the more than 8,000 spectators moved toward the edge of their seats. Norm Palovcsik, 1968 State Champion, reeled off Weiss’ accomplishments and his multitude halls of fame inductions. “It went on, and it went on. When Norm was finished, the arena erupted. Everybody stood and it was a standing ovation that I don’t think I’ve heard as loud or as long in my entire life. It could have easily gone on for very close to five minutes. It just kept going and going,” Gill said. Weiss has been inducted into the Pennsylvania Wrestling Coaches Association Hall of Fame (1970); the Clearfield County Hall of Fame (1987); the Pennsylvania Sports Hall of Fame (1993); the National Wrestling Hall of Fame (1995); and the District 9 Wrestling Hall of Fame (1999). Weiss has been inducted into 14 different Halls of Fame and has also been given the Albright College Lifelong Service Award and is in the Perkiomen School Hall of Athletic Honor. What a highly informative article this is! But the best aspect of it is the emphasis that Art Weiss put on being a sportsman! As a member of the Clearfield Wrestling coaching staff who came from a different part of the state, I quickly came to comprehend the impact that Coach had the sport. It just strikes me as small incident with a great man! I propose that the Borough continue to try to acquire the land along the river once occupied by Novey’s to create a park and name it for Arthur J. Weiss. Wonderful article – more complete than any other I have read! Thank you for publishing it. Art Weiss was a hero to so many people. I didn’t meet him until 10 years ago but grew to love him through my activities with the Clearfield wrestling program and the wrestling alumni club. In light of his tremendous achievements, he remained humble and was so gracious….always interested in what other people had to say, never trying to draw attention to himself. He always had an encouraging word and a big smile on his face. Over the years I had many conversations with him and his recall of details of matches and wrestlers was phenomenal. What a great, great man. The influence his life has had on countless wrestlers and the larger community will ripple throughout eternity. Clearfield was truly blessed when Art Weiss decided to make it his home and agreed to coach and found the wrestling program!